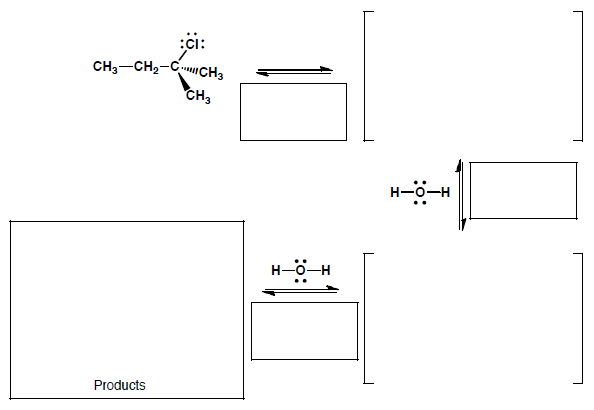 Solution: Complete the following mechanism for an SN1 reaction that occurs when 2-chloro-2-methylbutane is heated in water. NOTE, ALTHOUGH AN E1 PROCESS WILL ACCOMPANY THIS SN1 REACTION, WE ARE ONLY INTERESTED IN THE SN1 MECHANISM FOR THIS PROBLEM. Use appropriate arrows to show all movement of electrons, show all non-bonding electrons as dots and show any formal charges. If any of the species are really racemic mixtures of enantiomers, you only need to draw one stereoisomer and write "racemic". In the boxes provided, write which kind of mechanisitc element is being shown for that step, i.e. "make a bond", etc.